One of the FAQs on Coinbase.com and other Bitcoin exchanges is: “Why does it take so long to get my bitcoins?“. 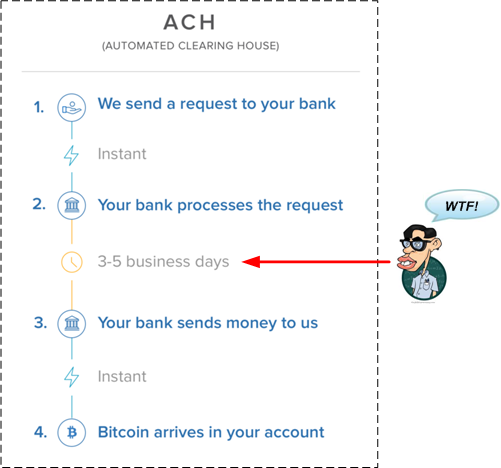 As the graphic below illustrates, the delay is due to the ancient “Automated Clearing House” (ACH) system that banks employ to process money transfers. 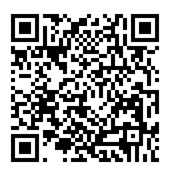 Prior to grokking the topic and personally experimenting with the technology, most people will probably say (as with anything radically new and different) that Bitcoin is too complicated for them. But hey, those same people (like me) most likely have no idea what goes on behind the scenes during the mysterious ACH delay when they use the current, antiquated banking system. And yet, they initiate this complicated process every time they move money between financial institutions. International money movement via wire transfer is an even more perplexing, costly, and delay-inducing process. As the bitcoin user experience improves as a result of the innovation taking place in the industry, the complexity of bitcoin technology will fade into the background; just like the opaque, byzantinian complexity of the current financial system technology has been pushed behind the scenes.